The Denali Park Road penetrates about 90 miles into the famous Denali National Park and Preserve. 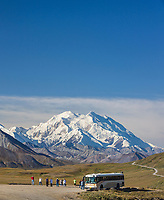 After the first 15 miles of pavement, the road turns to gravel and public travel is restricted to Denali tour buses only. It is a very scenic road that crosses four mountain passes and crosses many rivers. next » | 222 sample images from this category. Try a keyword search to see them all. Moose calf walks across the Denali Park Road, Denali National Park, Alaska. Tour bus on the Park road in Denali National Park, Alaska. Sanctuary river sign, Denali Park Road, Denali National Park, Alaska. Grizzly bear walks along the Denali National park road, Alaska. Denali Park Road, Denali National Park, Alaska. Bull walks across the gravel, Denali park road, Denali National Park. Tourists view caribou on the park road in Denali National Park, Alaska. RV on the Denali Park Road, Denali National Park, Alaska.